I often find myself thinking about the incredible waste of human talent inherent in junk email. If even a small percent of spammers spent as much time trying to solve even one of their country’s problems as they do trying to do an end-run around computer security systems, just think how much good could be accomplished. My spam blocker is pretty robust. Sometimes it’s a little too robust, so I waste time once a week scanning-and-deleting stuff in my spam folder in case a client used a word or phrase that filtered their email out. My preferences are set to show a preview of the first few words of an email’s content, so every once in a blue moon I’ll spot a gem amongst the scree. Have you noticed a certain genre of spam that contains scores of randomly-generated words in the email body? Occasionally you can even find poetry in those nonsensical strings, and they make the task of clean-up momentarily diverting. The grouping in the picture above is from one such email. Today is National Poetry Day, and what can I say – it spoke to me. I saw rain-spattered crowds of protesting people pouring into a square with signs lettered on colored paper, pressed between clear sheets to keep them dry. 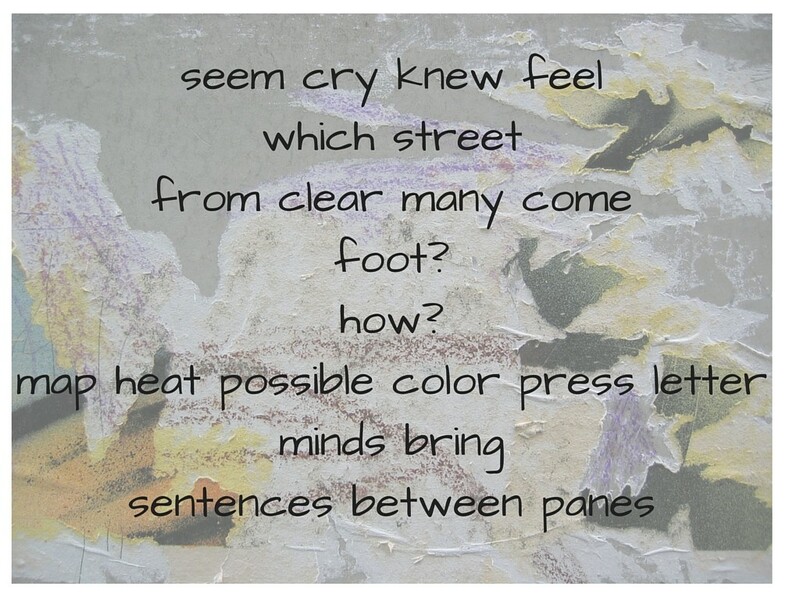 Sentences protesting pain between panes. When I saw that word-string, I thought sometimes there’s a message to be found, even in the dreck we have to deal with. Even spam can create transformative thought and action. We know from experience that positive change can come from horrible events. Observers can become participants, by waking up to what is happening around them, and voicing an opinion. Maybe even thinking it is their duty to stand and speak up. Some of you may be following the painful crisis in confidence in the UK charitable sector. If you don’t know what I’m talking about, it’s worth doing some reading up. The ethics, practices and pay-scales of the UK fundraising sector have been caught up in a media firestorm causing backlash against the sector because of a few very bad apples performing seriously questionable fundraising activities. We need to be aware and alert, because what’s happening in the UK will undoubtedly have a ripple effect here in the US and elsewhere. It could have a devastating impact on prospect research and some organizations’ ability to communicate at all with supporters. What has come out of this is a great deal of soul searching and healthy discussion as well as blue-ribbon panel recommendations. Thoughtful commentators on the crisis include (but are by no means limited to) Ken Burnett, Giles Pegram, Ben Rymer, and the forums created by Ian MacQuillin at think-tank Rogare at Plymouth University and Howard Lake at UKFundraising. Adrian Beney and his colleagues at More Partnership also added a useful white paper covering the Etherington Review and providing advice on its immediate and potential implications. As someone who spends a good deal of time working with clients in the UK and is deeply interested in the UK charitable sector, watching the way that our fundraising colleagues are taking a beating is hard to witness. I know that it’s not my fight and, as someone outside of the culture, it’s likely that I can’t understand all of the nuances, but I’m standing here with my colleagues holding up a virtual protest sign. What I hope emerges soon in this discussion is a public relations/media focus on all the good that the majority of charities actually do. A warm spotlight featuring what the Third Sector’s impact on society has been and just what our world would be like without their providing a safety net for an abused child; an education for a future disease curer; a cultural awakening for a previously closed mind; a stormy sea rescue; a saving meal for a shut-in. Because what charities actually DO is getting lost. It’s been rarely mentioned in the relentless media onslaught. I’ve been waiting to witness a fired-up group of charity trustees standing up and saying, “Wait, hang on a second. We’re board members of these organizations and, actually, they’re pretty amazing. And worthy of our trust. Let me show you a long list of examples of all of the good work that MY organization is doing. Where are the sector’s most highly-placed advocates? Where are the trustees’ voices when we need them? The charity sector is as imperfect in the US as it is elsewhere. Here, nonprofits used to send out tons of junk snail mail. It was wasteful on so many levels and its effectiveness declined significantly as the years went on. Email marketing didn’t start out much differently, but in recent years more attention has been paid to efficiency. Targeting. Segmentation. Research. Those efficiencies have led to more donor-centered communication and less waste. I’m not going to say that these segmenting/prospect research techniques are singlehandedly responsible for taking fundraising email correspondence from spam to strategic, but they have played a significant role. I worry when I read about the possibility that regulation might do away with prospect research altogether in the UK because it’s the very thing that helps charities find and communicate with people who want to be communicated with. As we know from Dan Pallotta’s important work, the charity sector everywhere is under fire. If fundraising is being rained upon somewhere, every single one of us who work in nonprofits – no matter where we are – is getting wet. have to care about what’s at stake here. We must of course ensure that our organizations improve our fundraising practices, but we must also be prepared and willing to quantify and stand up for what our sector actually accomplishes that’s good. What do you want to say?